Ecuador's state media watchdog SuperCom, the Superintendency of Information and Communication, today fined the newspaper El Universo 2% of its revenue from the past three months, in relation to a cartoon by Xavier Bonilla (known as Bonil). The newspaper was also ordered to print an apology and a revised version of the cartoon. 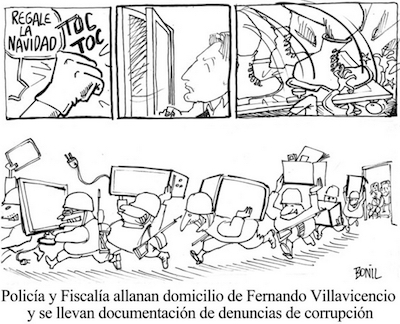 Bonil's cartoon, published on 28th December last year, depicted a police raid on the home of journalist Fernando Villavicencio, who had been investigating allegations of government corruption. The cartoon's caption stated that the police were removing evidence to avoid incriminating the government. President Rafael Correa criticised the cartoon in a speech earlier this month.